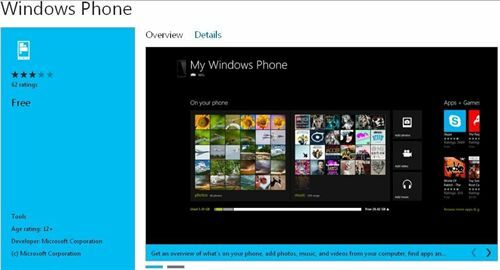 Windows Phone App Sync With Windows 8 is Now Available: A few hours before the official presentation of the latest mobile OS from Microsoft, Windows Phone 8, the largest software company in the world has risen to the Windows Store app sync with Windows 8, My Windows Phone. Although no one knows the release date of the mobile operating system with the launch of the first mobile-devices released so far not able to upgrade to Windows Phone , but to a more limited version with an identical interface, Windows Phone 7. Microsoft anticipated timing of all its software products with this app. The application promises a faster flow of data between the device ‘smartphone’ and the Windows 8 operating system automatically. So, the pictures and videos taken with the ‘smartphone’ is automatically saved to the computer to prevent loss, says the description of the app in Windows Store. You can also access the computer’s content (videos, photos and music, among other things) from the mobile. On the other hand, allows for quick and easy access to market Windows Phone applications from your computer or mobile device running Windows 8 and offers a quick download on the ‘smartphone’. My Windows Phone also controls the use of the device space, ordered by the number of applications and content, so that users better manage free space available for new applications. The free app sync is only valid for use in version 8 of the software, both for mobile devices and PC. Microsoft users are set to release new products that Redmond has scheduled this month. On Friday, the company made available to its users the full version of Windows 8 for PC, and the presentation of the new ‘tablets’ Smart Glass Surface and Xbox. On Monday October 29th come to the forefront the WP8 mobile software platform, with which Microsoft aims to reinvigorate its mobile industry. With it, the Redmond await the knock on effect on the market will lead to an increase in the share of sales of their devices, compared to its rivals Apple and Google. In this sense, Apple introduced a month ago its latest mobile OS, iOS 6, and it is expected that the next event will present the latest Google Android version, 4.2.